Of course, Cotter was referring to the effect of fertilizers on fruit yield. Pepper plants respond very well to fertilizers, but that response is mostly vegetative. Pepper grower Jeff Campbell of Stonewall, Texas, told us the story of his attempt to fertilize tabasco plants with large amounts of worm casings. The casings were so loaded with nitrogen that his plants grew six feet tall, and not one of them had a single pod! Excessive nitrogen causes the plant to return to vegetative growth and abort flowers and small pods. Seedlings can be fertilized with fairly high levels of nitrogen to encourage strong vegetative growth, but after the plants have adjusted to the garden, fertilizers should not be applied unless the plants have low nitrogen symptoms, such as leaf yellowing and stunted growth. Then they should be fertilized modestly. However, a lack of nitrogen can cause poor foliage growth, which exposes pods to direct sunlight and causes sunscald. For home pepper gardeners, organic techniques seem to triumph over chemical gardening because the vast majority of growers will be able to raise great pepper crops by simply adding compost and aged manure to the garden each year. However, nearly all commercial growers use a preplant fertilizer and regular applications of fertilizer throughout the growing season, undoubtedly because the heavy concentration of peppers depletes the soil and because manure and compost is not generally added to commercial fields. Peppers do not compete well with weeds. 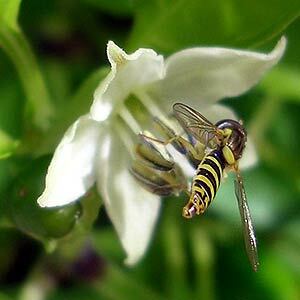 More than 150 types of weeds harbor insect-transmitted viruses that can harm peppers. Weeds often grow faster than peppers and can cut off sunlight, while stealing nutrients and moisture from the soil. They are also unsightly and produce seeds that will sprout in the garden the following year. If the garden is mulched properly, weeds will not be a big problem, but vigilance is always necessary in a pepper garden. Some species of weeds grow right next to the pepper stem and will be difficult to see under the canopy of leaves. Some weeds, such as Bermuda grass and bindweed, can invade the garden from other parts of the yard, cross over the top of the mulch, and sometimes establish themselves next to pepper plants. Gardeners should take pride in their pepper patch and remove weeds by hand, because hoes and shovels can damage leaves, stems, and the roots of peppers grown on ridges. Herbicides need not ever be used in the home garden, although some commercial growers need them. 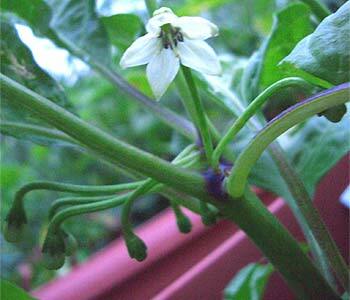 Flowers begin to form when there is a branching of the pepper plant. There is dicotamous flowering, meaning that one flower forms, then two, then four, then eight, and so on. The number of flowers produced is very large compared to those which actually set fruit, and a larger percentage of the early flowers set fruit than the later flowers. The key factor affecting fruit set is night temperature, which ideally should be between 65 and 80 degrees F. Fruit will not set when the temperature is above 86 degrees at night because of excessive transpiration, which causes blossom drop. Other causes of blossom drop are excessive nitrogen, high winds, and lack of pollination. If daytime temperatures exceed 95 degrees, pollen will abort and the fruit set will be reduced. In some cases, spraying hormones such as Bloom Set on the flowers may prevent blossom drop. A home remedy calls for spraying the blossoms with a solution of one teaspoon epsom salts in one quart of water. According to lore, the magnesium in the epsom salts assists in the setting of fruit. Pollination. Peppers are usually considered to be a self-pollinated crop. Pepper plants do self-pollinate, but their ability to cross-pollinate is far greater than expected. As early as 1892, J.H. Hart, the superintendent of the Royal Botanical Gardens in Trinidad, reported: “We do not make any specific distinction between the Capsicums from here for the simple reason that they degenerate so quickly to a simple form under cultivation that we cannot refer to them as more than a single species. Some of the finest will in four or five generations be nothing more than ‘bird-pepper’ of which the forms are as many as the days of the year.” Hart, of course, was allowing his peppers to cross-pollinate and later planting the seeds of natural hybrids, thus obliterating distinct varieties. In 1938, M.L. Odland and A.M. Porter of the University of Connecticut suspected that because of fruit variability, there was a higher percentage of natural cross-pollination in peppers than in tomatoes. Their classic study of the crosses (produced as a result of different varieties being grown next to each other) revealed cross-pollination rates averaging 16.5 percent, with a high of 36.8 percent in an ornamental variety. They noted that “the pepper flower is rather inconspicuous and non-fragrant, a fact that would suggest insect pollination not very likely.” But upon close examination of their test plots, they concluded that honey bees were responsible for the cross-pollination, and that “the wind accounts for only a very small percent, if any, of the cross-pollination that takes place in this crop.” An examination of the flowers of wild species, and wild types of the annuum species, reveals large drops of nectar. These drops reward bees for visiting the flowers. In 1984, Steven Tanksley of New Mexico State University found that the rate of natural cross-pollination in New Mexican varieties was far higher that suspected–up to 42 percent cross-pollination.. Bees were the culprits again–sweat bees, honey bees, bumble bees, and fruit cutter bees. His findings demonstrated the need for strict isolation conditions for the production of commercial seed. Other insects known to transmit pollen are ants, aphids, and butterflies. Any two varieties of the same pod type or species will cross, such as jalapeños crossing with piquins. Within the annuums, all varieties of all pod types will cross. Among the five species, the following scenario occurs. Annuum: Crosses prolifically with chinense, sporadically with baccatum and frutescens, does not cross with pubescens. Baccatum: Crosses sporadically with annuum, chinense, and frutescens; does not cross with pubescens. However, baccatum only produces sterile hybrids with other species. Chinense: Crosses prolifically with annuum, sporadically with frutescens and baccatum, does not cross with pubescens. Frutescens: Crosses sporadically with annuum, baccatum, and chinense; does not cross with pubescens. Pubescens: Does not cross with any of the other species. Gardeners can now determine which peppers will cross and which will not. 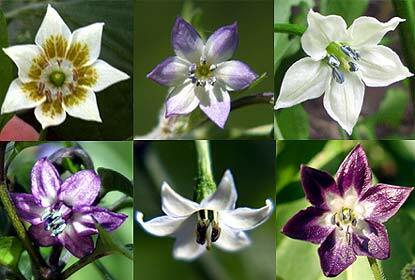 For example, nothing will cross with a rocoto, so all rocoto seeds produced in a mixed garden will be true. It is somewhat safe to plant ajís next to habaneros, because they only sporadically cross. Likewise it is somewhat safe to plant tabascos next to jalapeños or habaneros. 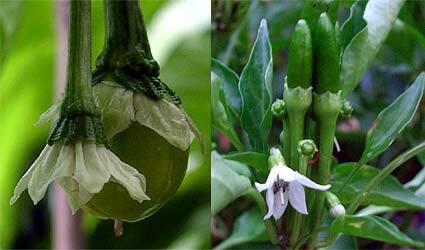 It is relatively easy to produce hybrids of the annuum varieties with habaneros. In some cases, the second generation seed viability depends on which species pollinates the other. When frutescens pollinates annuum, there is no viable seed, but when annuum pollinates frutescens, there is a limited amount of viable seed. Fruit development is enhanced by increased sunlight. More fruit will set near the top of the plant than within the canopy of leaves. The size and shape of the pod is inherited, but is subject to considerable modification by environmental factors. The size of the pods on the same plant tends to decrease slightly as the growing season progresses. Generally speaking, fruits are ready for picking in their fresh green stage at about 70 days after planting. Fully mature pods may take 130 days or more for some varieties. Fruit Load. The maximum weight of fruits that a fruiting plant can bear is known as its fruit load. The fruit load of each pepper plant is dependent on a number of considerations including stem size, amount of foliage, and the extent of the root system. When the plant achieves its fruit load, it ceases flowering. Thus a plant will stop producing fruit even though there may be a month or more left in the growing season. The pepper gardener can increase the yield of plants by picking pods in their largest immature green form. The plant will not have to bear the weight of the pods removed, will continue flowering and setting fruit throughout the remainder of the season, and the total weight of pods produced by each plant will be greater. However, the technique of periodic harvesting to increase pod yields only works in long growing seasons or with varieties having very short growing periods. In cooler climates, pepper plants may not reach their fruit load before the first killing frost, so picking pods early will not increase the total yield. Pungency. Mature pods are more pungent than immature pods. Generally speaking, stressing pepper plants increases their pungency. The restriction of water, or overwatering, will increase the amount of capsaicin in the pods. The pungency is also increased when the fruit ripens at high temperatures rather than cooler ones. In fact, the pods of New Mexican varieties ripening at temperatures between 86 and 95 degrees have twice as much capsaicin as those ripening at 59 to 72 degrees. Nitrogen that is applied after fruit set can lower the capsaicin levels. Pepper lore holds that the seeds are the hottest part of the pod, but this is not true. Although the seeds do absorb capsaicin during processing, in the fresh pods they are not very pungent at all. The most pungent part of the pod is the placental tissue, or cross wall, which holds the seeds and produces capsaicin. The pepper pod becomes less pungent from the stem end to the apex. Flavor. Each variety of pepper has its own set of aromatic substances that give it a unique flavor. The important flavor component of bells and jalapeños is 2-isobutyl-3-methoxyprazine. This chemical is the most potent aroma known to humankind and is detectable when diluted to one drop in an olympic-sized swimming pool full of water. Tabasco has twenty-three flavor components rather than a single dominant compound. The habanero has a particular, fruity aroma that is never forgotten. Gardeners should pick fresh pods, cut them open, and smell and taste them to decide which are better for various culinary applications. Improving the Yield. In addition to the methods described above, pepper gardeners have discovered other ways to produce more pods. One of the most common practices is the removal of flowers and early fruit. Dr. William Clapham, a plant physiologist at the University of Maine, recommends pinching off flowers for several weeks to increase fruit dry weight. He suggests that the pepper plants devote their energy to vegetative growth rather than fruit production, resulting in larger plants that produce more market-sized fruits. In another experiment, plants with all flowers removed as late as mid-July still had good yields. It is ironic that some gardeners use reflective mulches to increase yield while others use shading. Experiments have been conducted to determine the effect of shading on fruit yield in peppers. In the early 1970s, Paul G. Schoch of the National Institute for Agronomic Research in Guadeloupe, French West Indies, grew two groups of bell peppers in black plastic pots under identical conditions. However, one of the groups was shaded under black cloth between 10 a.m. and 4 p.m. each day. The black cloth permitted only 45 percent of the normal solar radiation to reach the leaves. After 60 days of this treatment, when the first flowers appeared, the plants were transplanted into open fields. The results were that the shaded plants had more fruits per plant, a greater mean weight per fruit, and a much great total weight of fruits per plant. The results also suggest that pepper plants transplanted from greenhouses, where the light conditions are lower, will yield more than directly- seeded plants. Some peppers grow well in shady conditions all year long. Chiltepins are usually found beneath “nurse” trees, especially mesquite, so these chile pepper plants are accustomed to low light conditions. However, we have grown Arizona varieties of chiltepins in full sun in the Southwest with spectacular results. 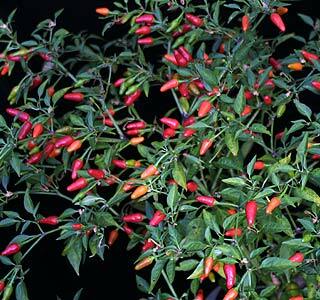 Potted chiltepins should not be grown in full sun or their leaves may yellow and drop. Shading is also useful for some varieties, namely the chinense and pubescens species in the high, dry altitudes of the Southwest that have high levels of ultraviolet light. During the 1992 growing season, both of these species performed better, and had higher yields under netting than they did in the open, unshaded plots. During the hottest days of July and August, many pepper plants experience water loss by transpiration, no matter how wet the ground is. The results are wilting, flower drop, and sometimes even fruit drop. Antitranspirants, oil or wax emusions sprayed on leaves to reduce water loss, are available. They do reduce water loss, but they do not increase yield or pod size. The simplest method of fighting transpiration water loss is to increase the humidity around the plants by wetting thick layers of mulch such as grass clippings.